Online Decision Support Systems (DSS’s) provide guidance in managing disease and insect pests using weather based forecasting models. These DSS’s predict pest development and risk of infection/damage. Weather data can be acquired from either on-site weather stations or by virtual gridded data. For 2017, Massachusetts apple growers have a choice of four DSS’s, which are briefly outlined below. Note that all these DSS’s require user input in terms of setting biofixes (when things happen in your orchard), including bud stage (phenology), and in some cases pheromone trap captures. Also, there is typically some initial setup involved, however, anyone can visit NEWA or Ag-Radar to view model outputs and pest management tools. You are encouraged, however, to get your own site set up on one of these DSS’s as it will be more accurate than a site that is “close to you." 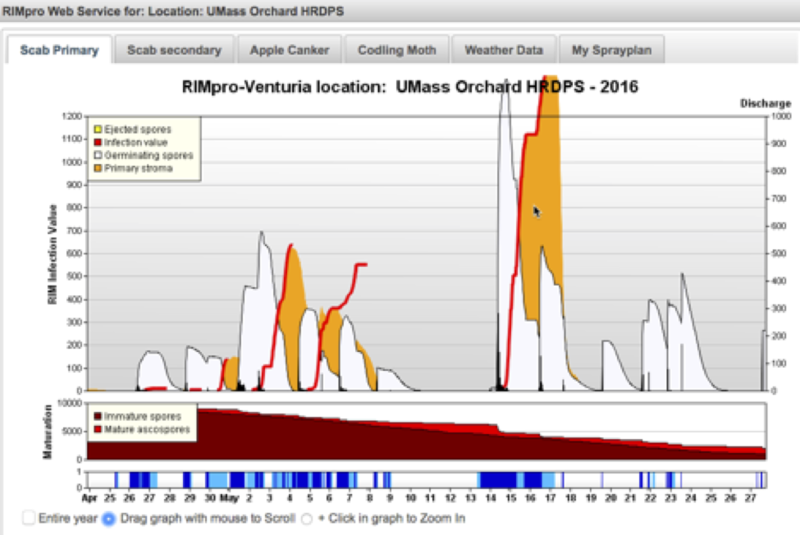 You will find these important tools for Integrated Crop Management should help you produce a better apple crop in 2017. If you have any questions, please contact Jon Clements, jon.clements@umass.edu  413-478-7219.